SpaceChem is an obscenely addictive, design-based puzzle game about building machines and fighting monsters in the name of science! Take on the role of a Reactor Engineer working for SpaceChem, the leading chemical synthesizer for frontier colonies. Construct elaborate factories to transform raw materials into valuable chemical products! Streamline your designs to meet production quotas and survive encounters with the sinister threats that plague SpaceChem. 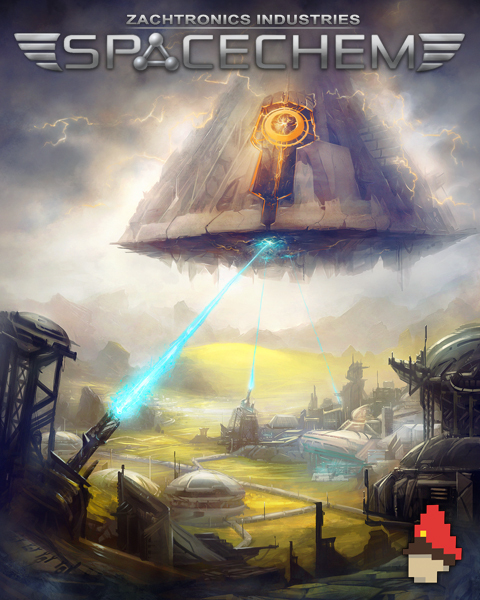 SpaceChem added to the Humble Bundle! All you Humble Bundle purchasers know the drill. Check out your Humble Bundle download page for links to Windows, Mac, and Linux versions of SpaceChem, the mind-bending, molecular machine-building puzzle game by Zachtronics Industries! In SpaceChem, you take on the role of a Reactor Engineer, designing complex reactors that transform raw atoms into the complex chemicals needed to survive sinister threats on the frontier colonies of space. It’s a maddeningly addictive puzzle game, and the recent addition of a level editor in the included “ResearchNet” update ensures that you’ll have plenty of challenging atomic manipulation at your fingertips. More than 150,000 Humble Frozen Synapse Bundles have been purchased with 8 days left in the promotion. Enjoy SpaceChem, and remind your un-bundled friends and family to visit humblebundle.com to score a deal on great indie games! Solve puzzles by building machines and fighting monsters, all in the name of science! It surely looks impressive, gotta try this!! Great game, although the tutorial could be confusing for less geeky players. Or maybe that's what the video's for; I didn't watch it (necessitating a YouTube video to play a downloadable game just strikes me as odd). This is definitely one of the better programming games I've played, and I like how you used the Periodic Table with it. I tried the demo with ubuntu 12.04 and windows 7, both install with easy and runs smoth. It's a great puzzle game, that makes me imagine how good it will be for some fun with chemical class at school. Will the update come to desura eventually? Having the "Update released" message ingame makes me nervous. game updated, why content on your servers is old? "The assembly mscorlib.dll was not found or could not be loaded. It should have been installed in the `/usr/lib/mono/2.0/mscorlib.dll' directory." And edited the file "~/desura/common/spacechem/spacechem-launcher.sh"
changing the line "./mono SpaceChem.exe" to "mono SpaceChem"
Thank you so much. Installing the dependencies fixed it. It should be noted that you no longer need to edit spacechem-launcher.sh because the most recent update has already changed it.